Company transformation is a recent buzz phrase. What does it mean? What’s involved? And how to get from A to B. In this blog we’re going to talk about Blocked or Negative Growth companies. The symptoms are straight forward; you’re exposed to changing markets which leave you with a falling customer base. With that usually comes a fall-off in the size of average sales and of margins. Which, in turn, means there will be growing cash flow pressures. This is not a good place to be. 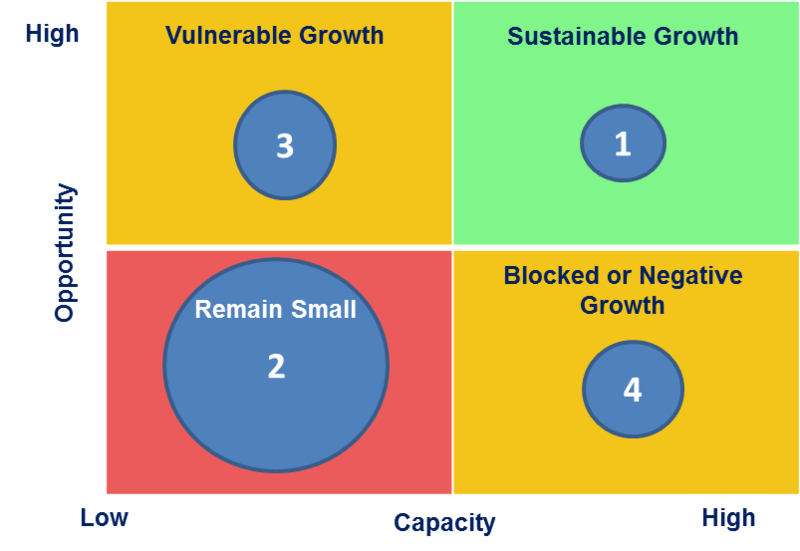 The Growth Map, opposite (Sector 4) shows the case of companies which have capacity to supply but are lacking opportunities (willing customers). Are you in this space? Our GrowthMentor Assessor helps you find out where you are (link on Home page). If you complete the 10 minute process you’ll end up with a diagram which could look like this if you’re in Sector 4. The example company has strength in Production & Delivery, reasonable Goals, and reasonable Corporate Support (company-wide management). But its Sales & Marketing is weak and its Future Development is very weak. There are no prizes for guessing what the for company survival. Transformation is required.
. Got to get customers! Need more Marketing! But, if the problem is falling or changing customer demand, there’s not much point in flogging a dying horse. What’s really required are new ways to find and serve customers through Opportunity Generation (finding and validating new opportunities) and Customer & Product Development (converting these opportunities into high-margin, readily saleable products and services). Straight forward? Not straight forward, at all. This calls for transformation – a change of direction and a new pathway. Which could involve new skills, new investments like R&D and plant, and a new business model. So you need to start at the beginning – not in the middle. What do the company’s shareholders want? How do they want to get there? How do they want to see the company managed? What sort of investments are they prepared to make? In other words, you need to re-orient and update your Corporate Support. Then, you can more safely tackle Future Development. Which will lead to a new Sales & Marketing view of the world. And possibly require you to change your Production & Delivery as well. But you need to creep up on the Future Development space by resisting the temptation to just throw Sales & Marketing at your current customers. Instead you need to back off and re-orient your company’s basic direction first. From that Future Development and new Sales & Marketing campaigns follow. Is this easy? No it’s not. But it’s likely to work better than any other strategy. The future is hard. It’s all out there but we’re not quite sure what it’s going to be. If you’re an optimism you know it’ll be better than the past; if you’re a pessimist you know it will be worse; if you’re a realist you know it will be different. Good companies are learning companies so realism is the way to go. Here are three sets of analytical thoughts to use. Think about why you were really successful. Then deconstruct that to find the elements which are not time-limited. Such as quality, design, customer responsiveness as opposed to cashing in on a one-off bonanza of government regulation (for instance). Build the durable bits into your next steps. Think about why you weren’t successful. Be tough on yourself. Eliminate these business strategies from your toolkit and these unproductive lines of thinking from your mind. Learn! Don’t be like the criminals in the Film Bandits who saw every possible option for gainful employment through the prism of robbing banks. (’But we’re bank robbers.’) These attitudes shackle you to old business models and old ways. You need imaginative options that play to what customers are going to want and to what you’re good at. Peter Thiel (Zero to One, Notes on Startups or How To Build The Future), who started Paypal, points out that if you have 10 opportunities one of them is likely to return as much as the other nine combined. The problem is you don’t know which one. 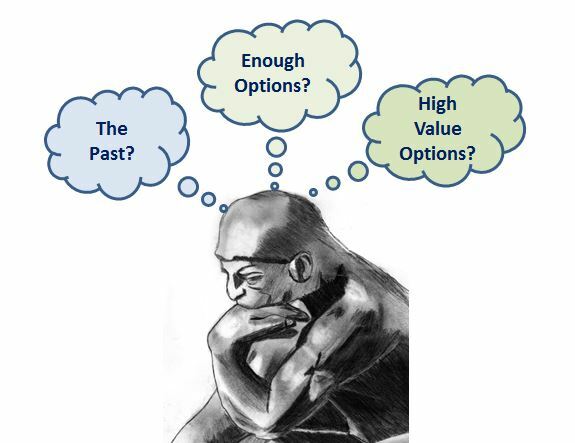 Options are essential, as is the willingness to move away from opportunities that are going sour. What do your reasonably validated forecasts show (ie; future profits and the necessary development costs of development and getting ready for market)? It is easily possibly to run discounted cash flow rulers (or discounted profit vs cost rulers) over projects. Do profits come out ahead? If they don’t. why are you thinking about that opportunity? A really good quick check is to compare the opportunity’s total likely EBITDA (Earnings Before Interest, Depreciation & Amortisation) with the total estimated development costs. If total EBITDA falls short, think hard! In my last blog, I looked at the different marketing options a business had to develop new business. Both to replace any decline in existing business and as a basis for growth. It’s now a good time to pause, and think about the way a business projects itself in its market place. You can see Values is at the centre of everything. By values I don’t mean the self-focused sort about ‘being the best in our field’ or ‘acting with integrity’. These are important, but less so that those that define how you’re going to provide your customers with a deeply satisfying experience in using your products and services. A couple of weeks ago, I was talking with a manufacturer of innovative welding products who said they’d realised they needed to provide the same sort of pleasure of use for their customers as users get from Apple products. Indeed, they recognised their competitiveness shouldn’t be based on price but on user satisfaction. So there’s a powerful link between Values and Customers. If this isn’t working, your customers aren’t going to value you as a partner in the success of their companies, you’re simply an also-ran provider. Which brings us to Value Proposition. This is the innovative way that you solve a pressing customer problem or need. To be attractive to customers it has to help them make their business models work more successfully (B2B) or their lives richer (B2C). So it has to fit with customer needs and the company values. Providing a good user experience is important; providing a good user experience about something that’s really important is a winner. And so to Operations. The company’s Sales & Marketing and Production & Delivery has to be run in a way that sustains and draws on the values that satisfy customers. You can depend on it that these will suit the way you’ll want to run your business, too. And now to Brand. Brand is an effective public expression of value proposition and values. It should capture it is that customers will prize; and what you’ll feel proud of. Getting brand right allow you to get your marketing communications right and your internal communications, too. 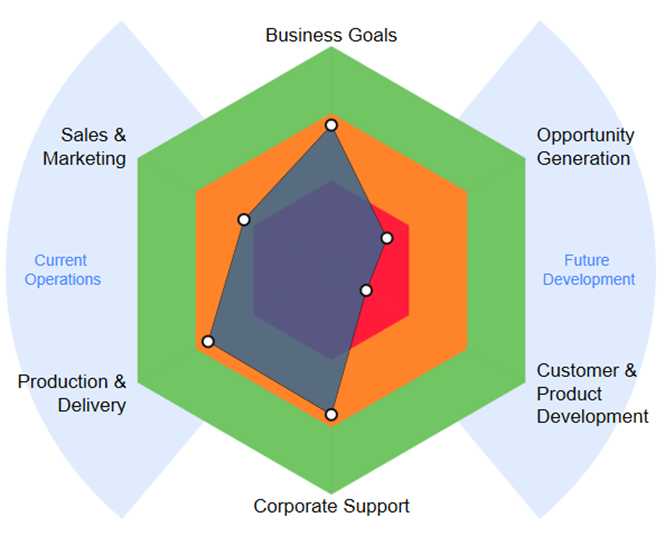 Try the diagram on your own companies and see how well the different elements align. It is almost an iron law of business that your existing business will erode each year. Just as disorder increases with time (the Second Law of Thermodynamics), that happy marriage between existing products/services and existing customers is going to fade away. Disorder at work. We encourage business owners to think about their retention rates for existing business. Let’s say this is 90% in each year. That means you need to find 10% of last year’s sales from new business to stay in the same place. Taking your existing offerings to new customers;. And, developing new offerings for new customers. (By offerings, we mean products and/or services). This is the homeland of tech companies and start-ups. It is high risk because you have to get the combination of new customers and new offerings right. You are dealing with two degrees of freedom and it is heavy on cash (and time). Remember those wry observations by product developers about projects taking twice as long and costing twice as much? So which strategy should you choose? This is a bit like the Irish joke about where to start a journey from. The newer your business is, the fewer options you have. And if you’re brand new, you’re inevitably in the high risk quadrant. In broad terms, you want to squeeze as much as possible from your existing investments in offerings and customers. So it’s logical, when developing marketing strategies, to work methodically from (1) to (4). We encourage CEOs to use this type of matrix to think through where new business has to come from, and then to match this with suitable strategies to manage risk and cost while getting results. One of the great things about the Australian Regular Army, my first regular job, was its relentless focus on learning. In my case I did four years at the Royal Military College, six months learning to be an Engineer Offices, and rounds of qualifying courses for promotion. This was not static learning. The Army was quick to learn the necessary lessons from current or recent operations. These were shortly applied formally, but first from the presence, throughout the structure, of people just back from Borneo and then just back from Vietnam. Unconsciously, they became organisational mentors and change agents. Recent oral history and personal behaviour were powerful influences. Mind you, some lessons had to be relearned. In my day, while the fighting arms were pretty current, the logistics side struggled initially from lack of recent real-time experience. The logistics deployment into Vietnam was initially a mess. But it very quickly improved. And worked well from there. Now SMEs are much smaller than the Australian Army and consequently much, much more nimble. But the same needs apply. You must learn quickly, or fail. If you don’t, a changing environment and poor internal performance will get you. Which brings us to the role of the CEO (who usually has the most to lose from failure, as well). Mentoring – helping the company team successfully apply and then review the lessons learned. To do this requires a strategic view of the world. What do you need to improve now; what changes can you anticipate and prepare for? This is one of the biggest challenges facing the CEO.